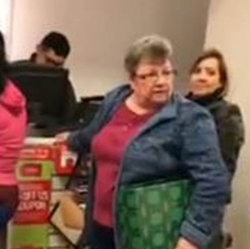 Millions have seen the viral video of a white woman’s racist rant toward two Latina women at a Kentucky store. During the whole video, I didn’t once hear or see anyone in the crowd telling the woman to stop her rant. It actually bothered me just as much as the actual racism because when we let the racism happen without interfering then we seem to be enabling the racism and inviting more of it in the future. This entry was posted in Culture, Politics, Progressive and tagged bigotry, bully, civil rights, Kentucky, racism, social justice on December 26, 2016 by Doug.